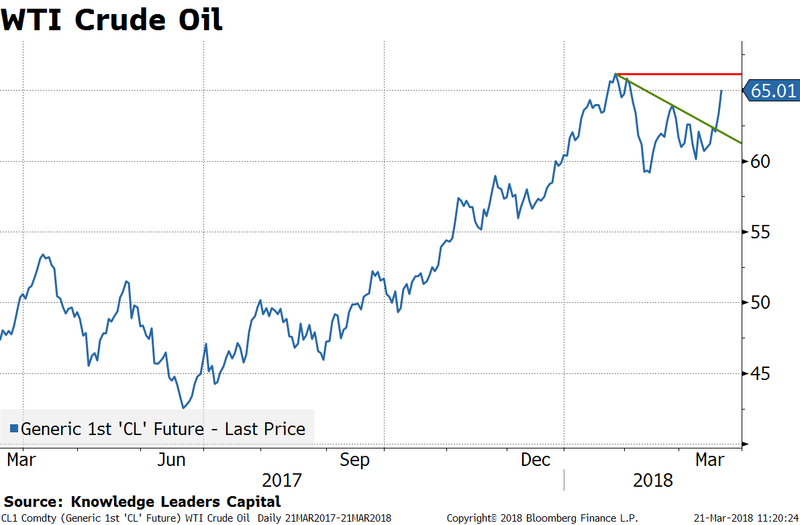 From Steven Vannelli, CFA: As of this writing, WTI crude oil is back above $65/barrel, closing in on the recent $66.33 high on January 26. While oil and US equities have been in a “wedge” formation where, hemmed in by the January 26 high and the February 90 low, crude oil has broken out from its wedge. This is good news for US energy sector investment grade credit. 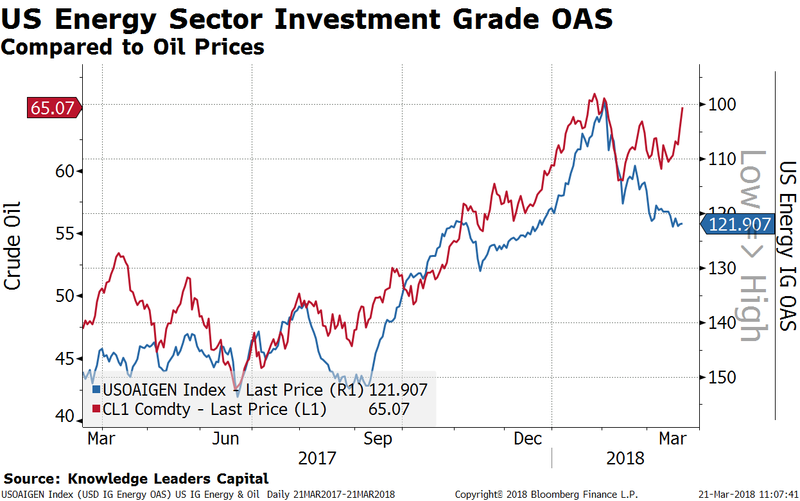 The move up in oil corresponds with an expected 20bps contraction in spreads to around 100bps. 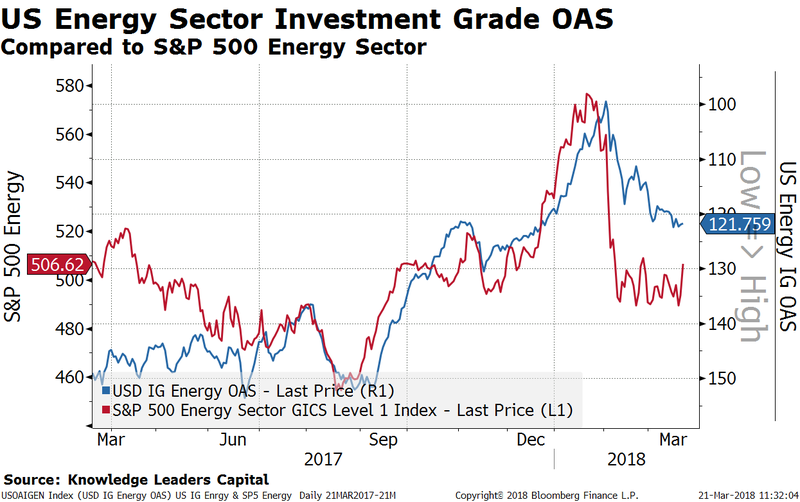 If US energy investment grade spreads retreat to 100bps based on oil prices, it is possible we could see a 15% move higher in energy shares. 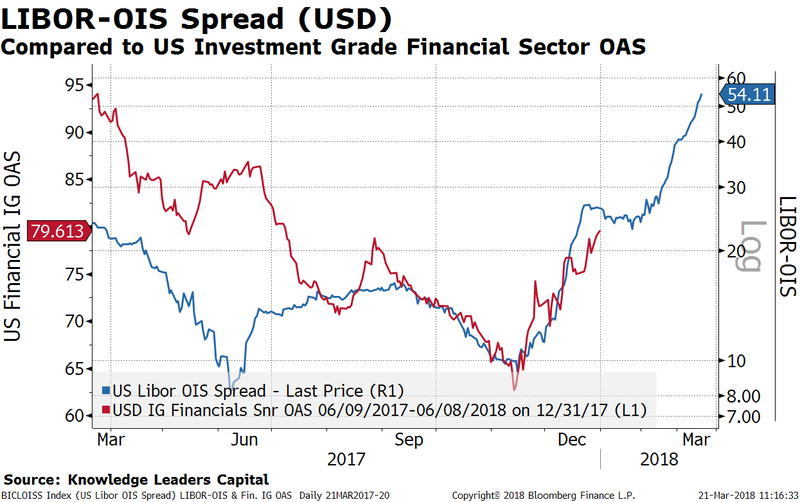 At the same time, the LIBOR-OIS spread is widening, which is a leading indicator for a widening in US financial sector investment grade credit spreads. At current LIBOR-OIS levels, financials spreads should widen by roughly 15bps. 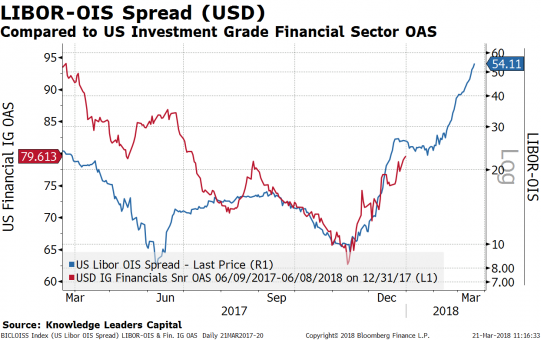 If funding pressures continue to push the LIBOR-OIS spread higher, financial spreads will possibly widen even more. 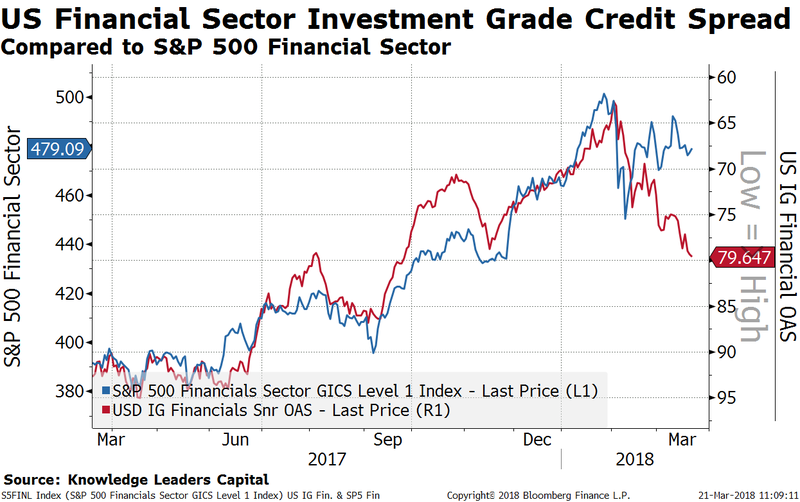 Widening financial credit spreads are a leading indicator for the performance of S&P 500 financial stocks. The widening already experienced could correspond to a 10% correction in the financial sector. Distilled, this is a basic pairs trade long energy and short financials. 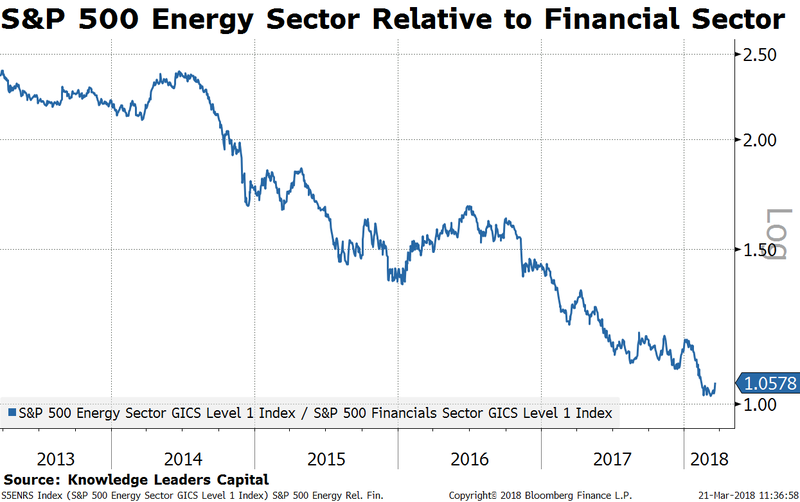 The Energy Select Sector SPDR ETF (XLE) was unchanged in premarket trading Thursday. 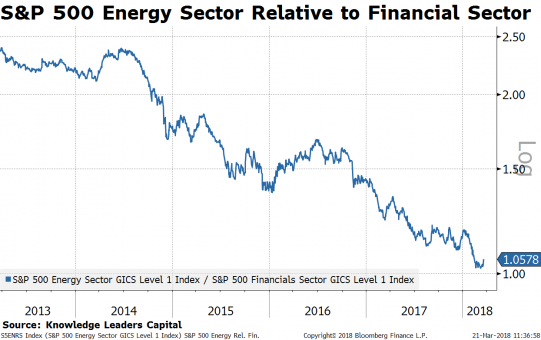 Year-to-date, XLE has declined -5.09%, versus a 1.34% rise in the benchmark S&P 500 index during the same period. 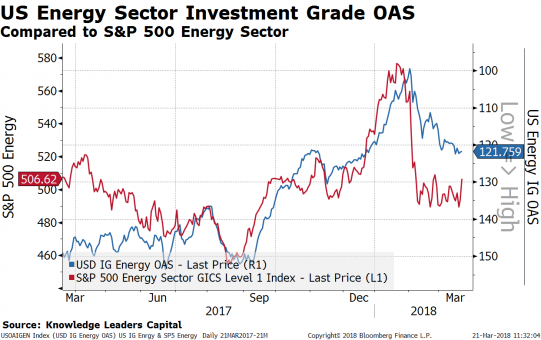 XLE currently has an ETF Daily News SMART Grade of C (Neutral), and is ranked #22 of 36 ETFs in the Energy Equities ETFs category.